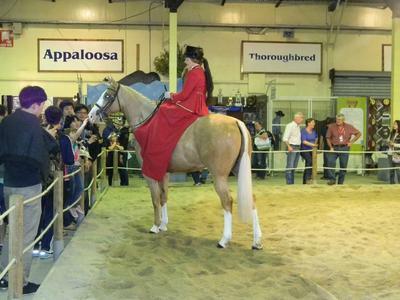 On the last Saturday, Razz helped Wendy Tidbold do a sidesaddle demonstration in the Horse Expo at Brisbane Royal Show. Wendy was very informative about sidesaddle and the history associated with it. She explained that it was deemed very unladylike for a lady to ride astride. At the turn of the 20th Century, riding sidesaddle along "Rotten Row"in Hyde Park on a late Sunday afternoon was the height of prestige for ladies to show off their mounts and beautiful dresses. It was the weekly London social event for high society. Of course, the ladies would arrive with two men in tow - one to hold the horse for her to mount and dismount, and one to hoist her up and help her down. Oh, if only this was still the case! Wendy holds sidesaddle lessons, and makes sidesaddles/ sidesaddle restoration. Razz has only been in sidesaddle for 2 x months - we are still getting our balance in the canter, but it's getting there. He will be ready for 2013 sidesaddle classes at Royals. Great display by the sounds of it.